Tallman, Laurna. Listening for the Light: A New Perspective of Integration Disorder in Dyslexic Syndrome, Schizophrenia, Bipolarity, Chronic Fatigue Syndrome, and Substance Abuse. Marmora: Northern Light Books, 2010. Print. 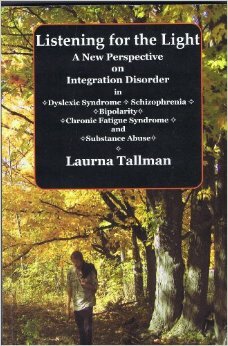 Listening for the Light (LFTL) by Laurna Tallman is a case study of one family’s experience with chronic fatigue syndrome (CFS), bi-polar disorder, schizophrenia, dyslexia, and substance addiction, among other illnesses. LFTL was originally published in 2009; however, it is not widely known, nor has it been widely reviewed, and despite the passage of four years, its content remains relevant. Tallman begins by meticulously describing the stressors she and her family faced over a span of several years: Tallman and her husband both suffered from CFS, four of her five children had varying degrees of physical or mental illness, and one child was severely dyslexic. The family also contended with poverty, broken school systems, dysfunctional communities, and even murder. It is against this backdrop that Tallman and her husband decided to use a monetary gift to send their son, Daniel, to Toronto’s Listening Centre, so he could get help for his dyslexia. The Listening Centre uses a “listening training program” to help people with a variety of issues, including dyslexia and autism. While at the Listening Centre with her son, Tallman briefly received her own listening training, which greatly alleviated her CFS symptoms. Daniel achieved great success as well; however, shortly after his Listening Centre experience, he suffered from a psychotic break and was diagnosed with schizophrenia. Whether intentional or not, Tallman’s poetic style has a pleasing effect that helps offset the at-times disturbingly sad and chaotic vignettes of a highly stressed household. Shortly after describing Daniel’s breakdown, Tallman demonstrates her wide-ranging writing skill by transitioning in style from poetic recitation to medical case study. She painstakingly outlines the treatment both she and Daniel received at The Listening Centre, then walks the reader through how this experience, combined with her study of medical and scientific literature, led her to undertake an investigation into the healing powers of music. She concludes that “…dyslexic syndrome, psychosis, and a number of other mental disabilities or instabilities appear all to be related to auditory-processing deficits and to fall on specific places along a comprehensive continuum of ear-related forms of mental function that includes the range of normal, ” and that healing for dyslexia, CFS, various mental illnesses, and other forms of trauma can come through “wise use of music” and “listening retraining.” (p. 333) This is a vast oversimplification on my part; however, I am far from equipped to summarize all of Tallman’s findings. Tallman’s writing is always enjoyable, but at times I found the subject matter too complex for my liberal arts understanding. I have a deep interest in the subject matter of LFTL, so it was worth it to me read and re-read passages, but for readers who are not so inclined, the middle of LFTL may be a bit much to plow through. Even if so, I still recommend reading at least the first and last of Tallman’s book, the former of which reads like a novel, and the latter of which summarizes findings in a more easily digestible format. The last chapter of the book also presents deep theological and sociological questions about how society does and should treat the mentally ill. Indeed, I would take this further than Tallman, and add that those in the criminal justice and foster care systems would greatly benefit from reading this book and considering its implications for treatment and rehabilitation for the acts that lead clients to either system. I would also beg those who choose to read this book to use patience to move past areas of potential disagreement, such as Tallman’s belief in the limited use of medications, that boys are unfairly treated by today’s classroom structures, faith-based references (though these are minimal and not at all taken into consideration in Tallman’s scientific research), and any other typically polemic area. These opinions are not relevant to Tallman’s findings, and can be glossed over to get to the end result (Tallman’s take on psychotropic medication perhaps being an exception to this). End result: Listening for the Light is lengthy, and at times perhaps too complex for most lay people. It is also poetic, operatic, moving, and absolutely fascinating. Not to mention it is a book that could do great things for those suffering from mental illness. If you have a deep desire to explore options to fix our broken mental health system, this is a great place to start. Related posts: Dual Diagnosis, When Christian Moms Get the Blues, Postpartum Depression: How My Church Helped and Yours Can, Too. This entry was posted in Book Review, Champion Your Cause, The Faithful and tagged mental health, mental illness, music therapy, Substance abuse. Bookmark the permalink. ← The Smell of Pumpkin Lattes Can Only Mean One Thing: It’s Almost Christmas! That is wonderful to hear, Bronwyn. Some people using music listening therapy for autistics stop therapy too soon. The experience of parents who insist on longer therapy gives better results. I think the understanding of left-cerebral dominance that came through my treatment of our schizophrenic son establishes important guidelines in the treatment of autistic persons. Thanks so much for your interest! My sister has amazing things to say about how music therapy has helped her 5 year old autistic son. It seems the healing power of music any disciplined listening is a vastly underrated and understudied possibility. Thanks for this review, Jamie.